Only two weeks until Christmas. These holidays have a way of sneaking up on me. Just when I think I’m ready, with all my shopping done and menus planned a wrench gets thrown into the plans. Suddenly, all over facebook, announcements that there are only 2 weekends left before the holiday. And I realize…dang it. Once again I have yet to do Christmas cards. I always have good intentions. And the guilt hits me over and over as I receive less and less cards every year. I know I’m being hacked off the lists of others for not reciprocating. I get that. I’m a slacker. I vow each year to do better. I wish each of you a very MERRY CHRISTMAS and a HAPPY NEW YEAR. I’m so thankful for all of you who stop by and read my blog. And take the time to leave me a comment or send me an email. I love hearing when you have tried a recipe, so please continue to do those things! In the meantime, I will continue to “cheesecake” all the things. 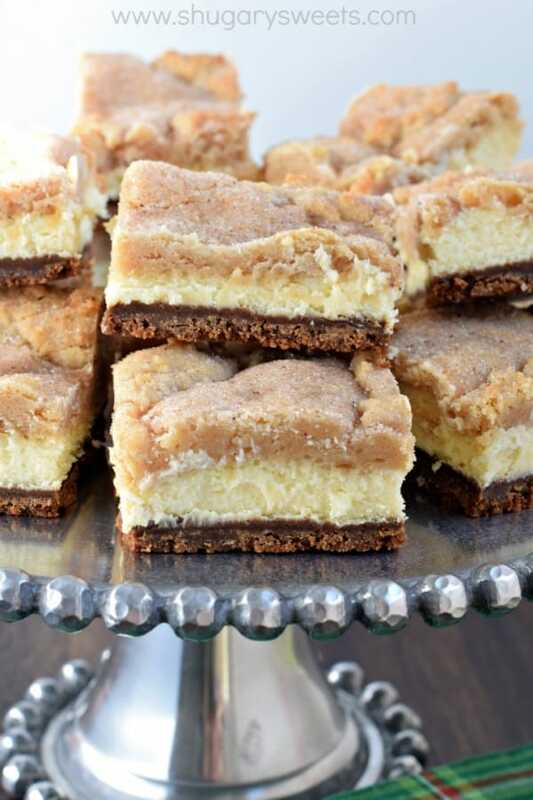 I sure hope you’re not sick of cheesecake bars. Because I’ve got more flavors running through my mind. Starting with today’s Egg Nog Cheesecake Bar. The crust. I used a whole bag of crushed gingersnaps for this gorgeous, flavorful crust. You can always substitute graham crackers or nilla wafers if you prefer, but I love the tanginess the gingersnap cookies give these bars. The cheesecake. No actual eggnog is used in this cheesecake. Instead a combination of rum extract and nutmeg gives the illusion that the creamy center is an eggnog infused delight! The cookie topping. Much like a snickerdoodle cookie, this version has 1/4 tsp nutmeg for extra holiday cheer. Oh, it’s also topped with a sugar, cinnamon and nutmeg crust. Yeah. It doesn’t get much better than this for dessert. HOWEVER, as a reminder, this needs time to “set up.” After baking these bars they need to chill for at least 4 hours. I usually make them the day before so that they can be refrigerated overnight. Once chilled, you can cut them and enjoy. Frozen Eggnog Whipped Cream. 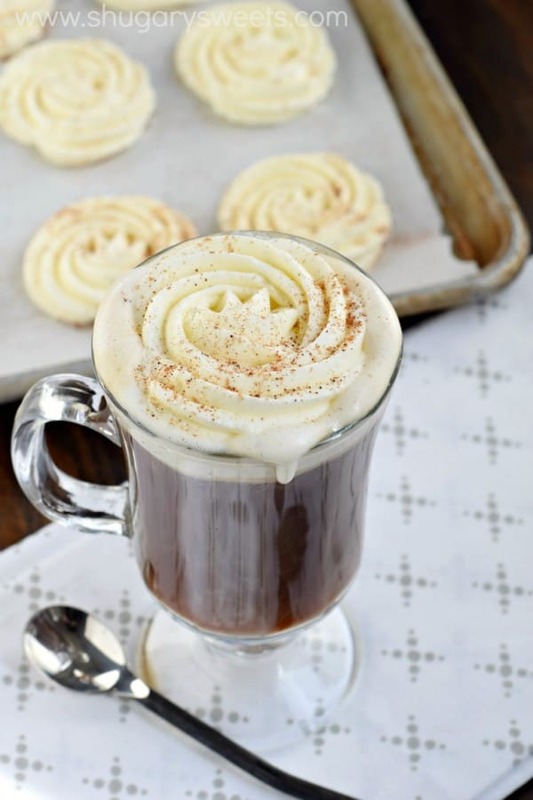 Make these delicious whipped cream discs and store in freezer until ready to enjoy on a hot cup of coffee or cocoa! 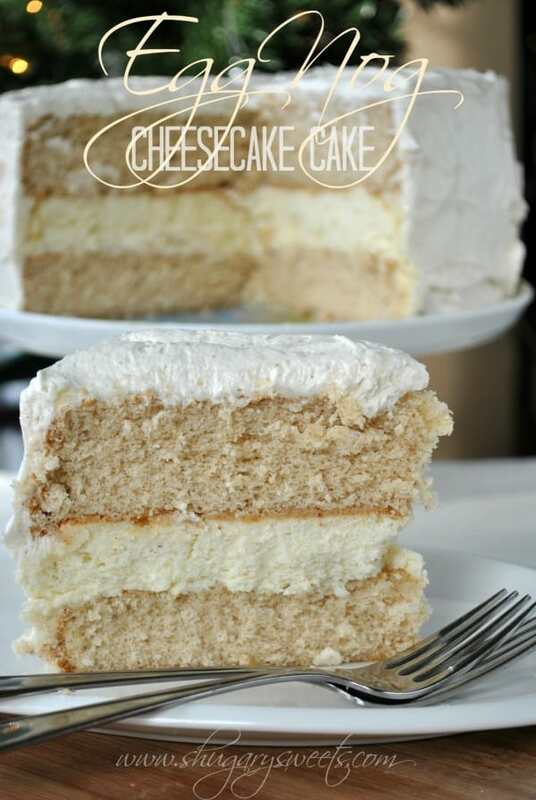 Eggnog Cheesecake Cake: a delicious layer cake that’s sure to impress. From scratch, spice cake with a cheesecake center and eggnog buttercream frosting! 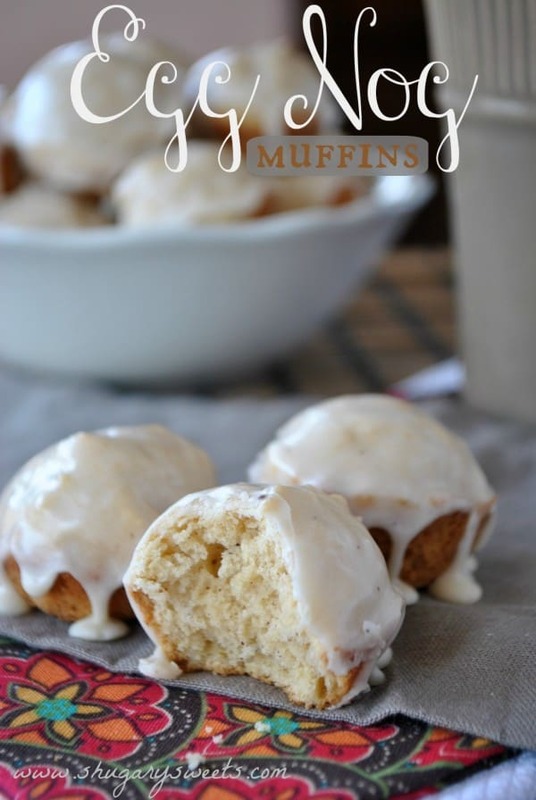 Eggnog Muffins: little, bite size donut muffins that are perfect for Christmas morning! 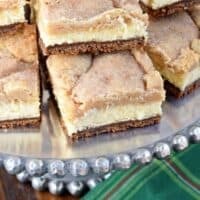 Layers of gingersnap crust, creamy eggnog cheesecake filling, and topped with cookie bars, these Eggnog Cheesecake Bars are a holiday must. Line a 13x9-inch baking dish with parchment paper. Set aside. Preheat oven to 350 degrees. In a food processor, pulse gingersnap cookies until fine crumbs. Add in melted butter and pulse until combined. Press crumbs into the bottom of prepared baking dish. Using the palm of your hand (or bottom of a cup) press crumbs firmly into the pan. For the cheesecake filling, beat cream cheese with sugar, eggs, rum extract and nutmeg using the whisk attachment of your electric mixer. Beat until fluffy and smooth (about 3-4 minutes). Pour over gingersnap crust. For the cookie layer, beat butter with sugar for 2 minutes. Add egg and vanilla and beat thoroughly. Add in baking powder, salt, flour, cinnamon and nutmeg and beat until fully combined. Add milk and beat until well blended. Scoop dough by large spoonfuls onto the top of the cheesecake layer. Use your fingertips to spread gently until the cheesecake layer is fully covered. In a small bowl, combine the topping ingredients. Sprinkle generously over the cookie layer. Bake for about 35 minutes. Middle may still "jiggle", that's okay. You want the cookie layer to be completely cooked (and lightly browned). Remove from oven and cool completely. Once cooled, cover with foil or plastic wrap and refrigerate for 4 hours (or overnight). Cut into squares and enjoy cold! I love that you put it online. I spend so much time and money doing cards every year and every year I say NO MORE CARDS!!!! I’d rather spend my time making and eating these bars! Oh my gosh Eggnog is like the best thing ever I have to make these bars!! That’s the best card! 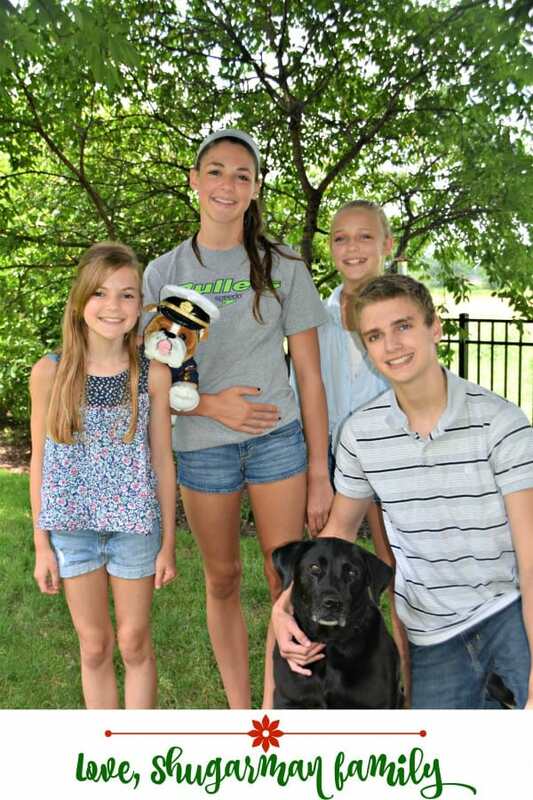 Your kids look like such a nice bunch. You must be a very proud mom! There’s no time for cards when there’s life. And cheesecake. Priorities, people! These bars are the best. That cookie layer on top is great! I made your Fannie Mae fudge and loved it! When you say to “wrap in parchment paper and store in airtight container”, should this container be refrigerated? You Aimee are the queen of eggnog! 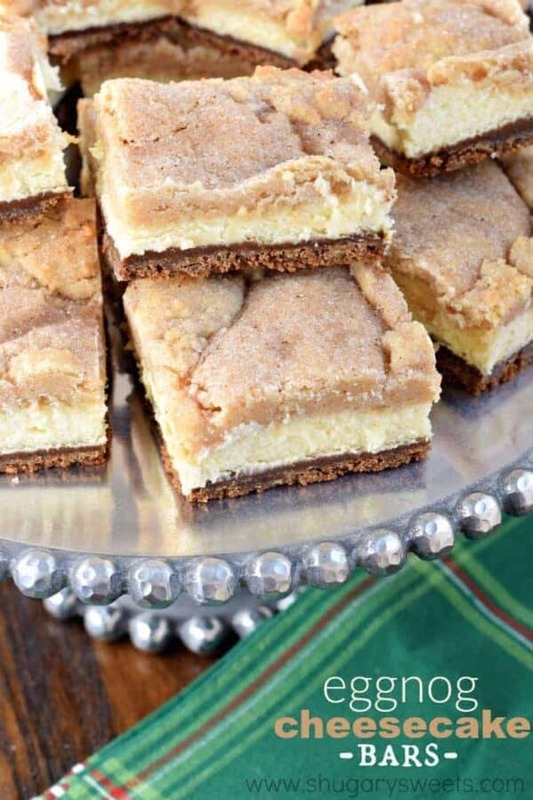 These cheesecake bars look absolutely scrumptious! Only two weeks to Christmas? Freaking out! Hahaha but so exciting! Ooh, I’m not the only one freaking out a bit? LOL!! Aimee, You’re kids are beautiful! May your family have a blessed Christmas and a wonderful 2016! Thank you 🙂 Merry Christmas!! Hahaha! Too funny that you posted it here instead of doing cards. I usually do handmade cards every year, but last year and this year I went with the photo card option. This year I ordered one that could be printed and mailed in under 5 days…gotta love that! Now to get the cards addressed and actually in the mail. I may have a stack of cards that never got sent out a few years ago. Whoops! 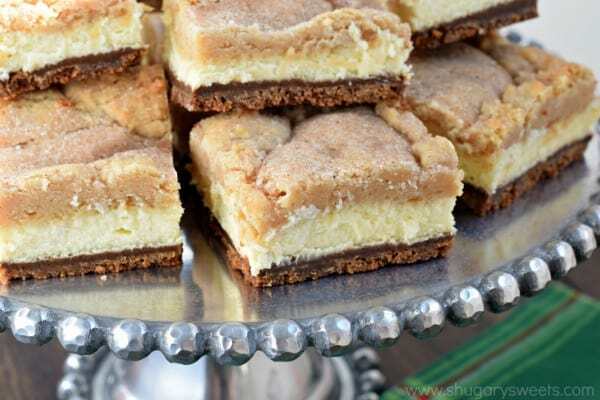 Maybe I should just bake a pan of these awesome cheesecake bars! Eggnog is one of my favorite holiday flavors! 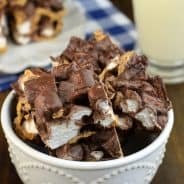 I am planning to make these for a holiday get together this weekend. However, I have one question. Can I use real rum instead of rum extract? I am afraid I won’t be able to find pure rum extract, but I do happen to have a bottle of dark rum on hand. 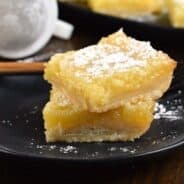 Hi, how long do the eggnog cheesecake bars last, and can they be kept in an airtight container or do they need to be in the fridge? I ask because I would like to make them for little packages of mixed cookies/bars for gifts. Because of the cheesecake, they definitely need to stay refrigerated. They are best eaten within the first two days, after that the cookie layer on top begins to soften. While I love many of your recipes, these are not at all eggnog flavored and do not actually have any eggnog in them. They tasted like rum cheesecake to us. The concept was great and I am going to try to adjust it to have real eggnog in them. I am only mentioning this for those who are looking for an eggnog flavored cheesecake as they may want to try a different recipe. Eggnog is basically milk, cream, sugar and rum…and some people add nutmeg. So in essence, yes, the cheesecake IS eggnog flavored without using eggnog. I did clarify in the text that no eggnog was used for this recipe. Oh and eggs. Milk, cream, sugar, and eggs…. I did not mean to offend you in any way. I just wanted to point out that it does not taste like eggnog at all so if someone wanted something eggnog flavored they may want to adjust the recipe. While eggnog may have milk, cream, sugar, eggs, and rum, the recipe does not have those ingredients. I am not sure how the cheesecake is eggnog flavored without the eggnog ingredients and without actual eggnog. Cream cheese is made of milk and cream….the recipe includes cream cheese, sugar, and eggs plus rum extract. And voila…an “Eggnog Cheesecake” 🙂 I guess in this case it’s up to you and your palate…our family and friends definitely thinks it tastes like eggnog flavored cheesecake. My future daughter in love is a huge eggnog fan! She will love these! Your kiddos are getting so big! Eggnog and cheesecake?! Does is get any better? YUM! Wow these egg nog bars look seriously amazing! Two of my favorite things together in one dessert! Sign me up! Yummmm!! I am totally going to make these! They look so amazing! 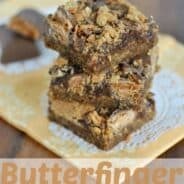 These bars are absolutely amazing and will be perfect for the holidays!